In keeping with its firm belief in the benefits of the U.S. 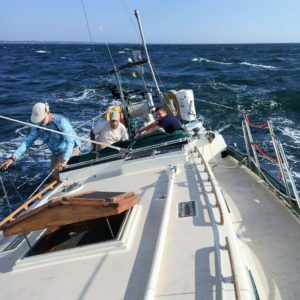 Naval Sea Cadets Program, Retlif Testing Laboratories (Ronkonkoma, New York), a leading independent EMC and Environmental Simulation testing organization founded in 1978, recently sponsored a ‘Voyage of Discovery’ aboard the Nada, a 47-foot sailing vessel. The U.S. Naval Sea Cadets program is designed to build leadership in young men and women by exposing cadets to the full rigors of a military training program for potential paths they make take after high school graduation. The planned sea route took them into the Gulf of Maine, and the 47-foot vessel was soon beyond all shore-based communications. 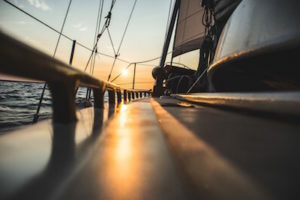 Captain Noakes and the six Sea Cadets relied on daily satellite phone calls with a shore-based contact who relayed weather forecasts and important information while confirming that all members of the crew were safe. The “Voyage of Discovery” took the Nada to the storied and infamous St. George’s Bank (AKA George’s Bank), southwest of Nova Scotia, which is the most westward of the Great Atlantic Fishing banks. In fact, St. Georges Bank is the largest and most important fishing ground near the U.S. Atlantic coast. In explaining the area’s notorious reputation, experienced mariners often cite the abrupt and unexpected weather changes that are so prevalent. The Sea Cadets aboard the Nada soon experienced the seas that sailors have encountered for centuries. With its dense, interminable fog, stormy weather and cold ocean currents, as well as 15-foot ocean waves and winds approaching 40 knots, the Sea Cadets received a firsthand education and appreciation of the rigors of a military training program. The dense fog limited visibility to a few feet, and as Captain Noakes remarked, “in these conditions, we relied almost entirely on the radar made possible by a generous donation from Retlif Testing Laboratories. The radar helped the 47-foot Nada avoid run-ins with 100-foot ocean fishing vessels, which could have spelled disaster if one had surprised us emerging out of the mist”. As Giovanni da Verrazano, Henry Hudson and John Cabot must have encountered while exploring these waters during the Age Of Discovery, the sea is a fickle mistress, and the Sea Cadets recognized this at the furthest extent of their journey.A satellite call informed the voyagers that a tropical disturbance forming in the Caribbean had hurricanepotential with storm force winds. The storm’s projected path included the vicinity of the Nada, and it was decided to head back home. 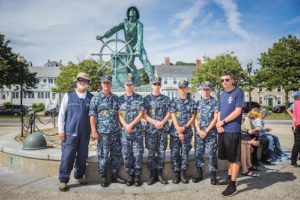 The Sea Cadets’ route returned them via Cape Cod and the Nantucket Shoals as the tropical disturbance developed into Hurricane Gert. In port when the resulting huge waves came to dominate the area, the Sea Cadets learned an invaluable lesson of the sea…respect for the mighty realm of Poseidon. Retlif’s sponsorship of the U.S. 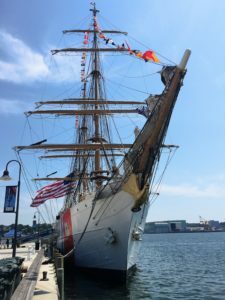 Naval Sea Cadets and the “Voyage of Discovery” program has helped to ensure the future with hands on education and instruction. As Mr. Poggi explained, “The concept of ensuring the future underlies every EMC test and all the torturous Environmental Simulation or ESS testing that maritime and military products undergo en route to compliance. I think the dedication of the U.S. Naval Sea Cadets certainly bodes quite well for sea power and consequently for the future of this country. We at Retlif are proud to stand behind them and to do our part to ensure their future success”.